If you worry for the sanity of your precious lawn gnomes, please don’t continue reading. This is not for you. Your lawn ornaments will not be happy with this creepy addition to your greenery. Law enforcement might not be too happy with this either. There is sure to be some unwanted calls to the police about the corpse which is seemingly emerging from your garden. The Garden Zombie is not for the faint of heart. It will scare the hell out all of the other doodads you have lying around your grass. 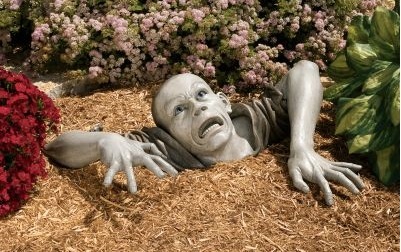 Created by British artist Alan Dickinson for Toscano design, the Garden Zombie would be an awesome addition to your exterior decor for the Halloween season or just simply a way to scare those damn kids off your lawn. The morbid land ornament is so realistic that people might think that the zombies are finally attacking. Tired of their underground prison. Lucky for us, the zombie is indeed just a sculpture, no matter how realistic the life-sized gray-toned Garden Zombie looks. The Garden Zombie ships in three pieces, measuring 31½” x 19½ Dx 8″ and weighing 13 pounds is available for purchase for around $90. It’s a little pricey for something you place outside in your garden, but it might just be worth the piece and quiet, not to mention the looks you get from neighbors.